Computer Views Review – Does Less Glare Help Eye Fatigue? Does Computer Views Really Work? Computer views glasses are claimed to reduce the glare from your computer or television which is known to sometimes cause fatigue.The question is do they really work? It has actually been shown that digital devices can cause fatigue and eyestrain. Tons of people spend many hours during the day using these devices, and don’t realize that their tired eyes or feeling of fatigue could be coming from this.During the day its computer usage then perhaps at night a few hours of television or playing games on the tablets. It can get to the point where the eyes begin to itch or burn which then takes the enjoyment out of using the computer or television. This particular eye strain problem has been called computer vision syndrome, and one of the recommendations that the experts in this field recommend is to cut the glare. 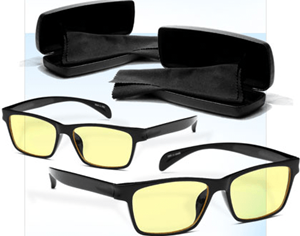 The company promoting Computer Views claims that these glasses will give the user a sharper and clearer viewing experience when they are used for watching TV or on various computers like desktops or laptops, and even when using computer tablets. They claim that they improve focus, and not only are they stylish but they are lightweight and comfortable, and are effective at cutting the glare created by digital devices. They say that these glasses work because they have specially formulated lens material, tint and coating. With more and more people of all ages using digital devices, and the identification by medical experts that these can cause eye fatigue that has actually been diagnosed as computer vision syndrome, the Computer Views glasses promoters is capitalizing on providing a solution where a need has been identified to cut the glare of the digital items. We have found that there are similar type products already online that appeal to individuals that are suffering from this type of eye problem. The cost for the Computer Views glasses is $26. which includes the shipping & handling, plus the bonus which is a second pair of the glasses. There is a 30 day money back guarantee but it doesn’t include the S&H, so if you did send them back you are losing about $16. If you compare this price to a similar product like Sheer Vision which sells on Amazon for $38. then the price for these Computer Views appears reasonable, although Sheer Vision has a few more features like UV protection and claims to reduce headaches from UV glare. If you are going to purchase this product then you are going to have to train yourself to remember to carry them with you during the day, so you can take advantage of them during your work or school hours. This is where the bonus of having a second free which comes with your purchase is ideal. You can leave one pair at work or school, and keep the other pair at home. Keeping the actual purpose of these glasses in mind is important. If you are looking for something that claims to improve your actual vision then you would want to look at something like the Instant 20/20 glasses. The Computer Views are meant for glare, and the success for reducing this all depends on the formula that the lens are comprised of which is not shared in detail by the company making them. Their promotional material gives an example of the reduction in the glare which appears to create a significant reduction, which should be beneficial. Another positive feature about the Computer Views is that they are stylish so you aren’t going to mind wearing them in a public setting. Being able to reduce your eye fatigue will allow you to enjoy your digital products much better. We are giving the Computer Views a Thumbs Up rating. When you consider how important our eyes are to us, then anything that is going to help protect them from something like this particular eyestrain is of value. Not becoming as fatigued through the day when working or going to school as a result of eyestrain could help your performance. Plus you get to enjoy your digital products a lot more. Having the extra set provided by the bonus is an additional asset, so you are more likely to use them both day and evening. Anything that helps to reduce any type of fatigue is a good thing. Feeling less tired and not having to put up with irritated eyes because of the digital strain on the eyes could very well mean you can get your work done much better and quicker through the day, and still enjoy some digital entertainment at night. What do you think? Does Computer Views work or not? Does Spray Perfect Really Work? Does the Weight Loss Grant Program Really Work?